No-huddle offenses want to do the exact same thing, combine speed and conditioning to push a defense past its breaking point. The elite level of the no-huddle combines tempo with play call and formation to manipulate a defense. Our film study reveals how Oregon uses a series of two-play sequences to create defensive busts, keep a defense locked in a bad alignment, and set up play action passes. This article will analyze how Oregon combines no-huddle tempo with packaged run/pass plays and unbalanced formations to “drown” a defense. This play sequence against USC last season is a great example of playing fast in an attempt to get the defense to mis-align. In play 1 of the sequence (above) Oregon runs its pin and pull Outside Zone Read to the right packaged with a Bubble Read “Now” screen on the left. After an efficient gain on this play, the Ducks will use tempo combined with an unbalanced formation to test the defense’s ability to adjust in the play below. In play 2 of the sequence (above) Oregon quickly lines up in an unbalanced three receiver formation set into the boundary or short sideline. USC is forced to flip their secondary toward the boundary to cover the Duck “trips” receivers (three on one side). The picture above shows Mariota giving the center the indicator he’s ready for the snap with his hand (red box) while USC scrambles to get lined up. The pre-snap end zone view prior to play #2 shows how tempo has compromised the USC defensive front. The panic created in the Trojan defense has put them at a disadvantage on the wide side of the field. USC has moved all but three defenders into the short sideline boundary on the right and exposed itself away from the offset tailback on our left side. When the ball is snapped USC has managed to cover down Oregon’s three receivers with their four defenders. However in doing so, they have also given up leverage to the wide side of the field or again our left side. Mariota sees the USC overplaying the formation into the right boundary and gives the football to the running back going to the left. The end zone view of the play 2 after the snap shows the interior advantage created by playing fast. The Ducks have four blockers for the four closest Trojan defenders (yellow boxes) to the Duck ball-carrier. This means there is no defender “free” to make the tackle as we have hat-on-hat blocking! Tempo has already moved the other four defenders in the picture out of position, and thus they are unable to prevent the end result, an Oregon touchdown! This second sequence of plays run against Washington shows how tempo can keep a defense stuck in a defensive call. Play 1 (above) in the sequence starts with the formation set into the short sideline boundary on the left. Washington lines up in a 2 high safety defense that makes them vulnerable to the interior run. When the ball is snapped Oregon’s backside tackle blocks the backside defensive end. With the quarterback’s read key (green) lined up in the alley and sprinting towards the bubble, Mariota hands the ball off for a huge gain. Oregon recognizes this advantage in the box and hurries to the line of scrimmage (above) and runs the exact same formation and play. Washington responds with the same defensive front and coverage and gets the same result, a big gain up the middle by the tailback. Play 2 of this sequence above is a great example of tempo locking the Huskies into a bad defensive alignment call. 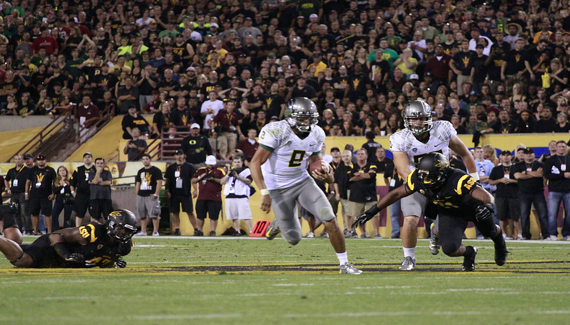 This end zone view of the second play in the sequence shows why Oregon’s offense wanted to get (and keep!) Washington in this defensive front and coverage. The formation set into the boundary creates a huge seam in the defensive front right on the hash-mark. By snapping the ball before the defense can adjust or change the call the Ducks take advantage of the same defensive look two plays in a row! This last sequence of plays shows Oregon using tempo and formation to set up a down the field “Shot play.” In play 1 (above) of this sequence the Ducks call the unbalanced zone read bubble and get an uncovered Bubble screen look by USC to the wide side of the field. Mariota reads the numbers correctly and throws the ball out to the Bubble screen. The two outside receivers secure the double team on the perimeter resulting in a first down for Oregon. Oregon lines up in an unbalanced formation to the left sideline boundary again on play 2 of this sequence. The difference this time is that they’re using tempo to set up a Play Action pass down the field. At the snap the tailback fakes the Inside Zone Read to the right, while Mariota pump fakes to the outside receiver running the Bubble “Now” screen. The number 2 and 3 receivers in the Duck formation run vertical routes trying to get behind the USC corner and safety (green boxes). As Mariota progresses through his read of the coverage, he bails on (declines throwing) the deep routes (green boxes). Quarterbacks are commonly taught to watch for, “Touchdown, then check down” on deep passes and Mariota does just that. With his deep “touchdown” routes covered, Mariota goes to his check-down, the Bubble “Now” screen by the #1 receiver and it is open! The check-down to the Bubble “Now” screen was a great read by the Duck QB as the receiver has a ton of room to run due to the nature of the play call. The vertical stretch of the Play Action pass – along with the tempo of the offense creates a great match-up in open space for one of the speedy Duck receivers. Great no-huddle offense is more than just a bunch of guys running around on the field. It combines a breakneck pace with planning, practice and execution. The three ‘two-play sequences’ analyzed in this article show us that there’s an enormous amount of reading, on-the-field analysis, and precision execution when the Ducks step on the gas. Oregon combines tempo, packaged plays and unorthodox formations to pull the defense into deep waters, then the Ducks No-huddle attack drowns defenses.